We know that exercise is good for mental health… so why aren’t we doing it? Exercise is good for mental health. This is hardly a new discovery. How many times have we heard this on the radio, or in the news? Exercise is certainly a well-known stress buster. And, in comparison to other mental health interventions, its advantages are clear: No six-month waiting lists, no trial-and-error game with medication and no side-effects. It’s hard to imagine then, why people with mental health difficulties would not be exercising. Generally speaking, why wouldn’t people exercise? Well, because it can be boring. Because we don’t have the time. Honestly, because we’d rather be doing anything else. The supposed benefits of exercise don’t always feel powerful enough to outweigh these things! It’s simply not enough. And for those with depression, the last thing they may wish to do is to put on some running shoes or click on a workout DVD. Workout clubs and classes aren’t necessarily a socially anxious person’s idea of a great time either. The fact remains though, that while exercise may not be appealing to everyone, it can provide some real long-lasting relief. It’s not only been shown to reduce a number of mental health symptoms, but it may also prevent them from happening in the first place. The potential benefits are clearly huge. Possibly even life-changing! Which is why it’s our responsibility to get this message across- but in a way that’s convincing. Otherwise, research into exercise and mental health is not having a meaningful impact. As for me, it was only by chance that I decided to hop onto my Mum’s treadmill one day. I can’t emphasise how unappealing exercise was for me- until that day. I’ve genuinely not looked back since. Exercise has become my sort-of natural medicine. It doesn’t completely stop the thoughts… but they’re certainly less loud. It doesn’t fix the fear, but I no longer feel on fire! And realistically speaking, isn’t this what we should be aiming for? Because a wave of anxiety is comparable to a storm: we know the storm will pass eventually, it always does- it has to. Equally, we know that it may resurface. But in the meantime, exercise enables me to cope with that storm. During that thirty minute timeslot when I’m running, it’s as if there’s a temporary state of peace. Normality. It’s an essential management tool that I rely on week after week. I always notice a difference when I haven’t exercised. My brain notices. There’s a real case for why people with mental health difficulties should give exercise a go. We’ve got to find better ways of illustrating this. 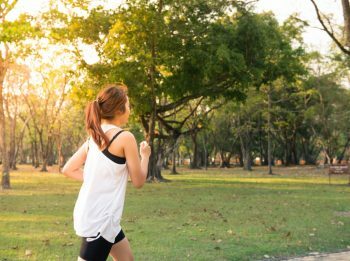 The BBC recently released an article exploring how running helped people to manage a range of mental health difficulties, such as anxiety, depression and OCD. Maybe this is a good start: let’s ask people how exercise has helped them. Rather than rely on researchers to tell us what works (because chances are that we won’t listen), let’s hear from those who’ve had similar experiences to us. We can listen to people with lived experience of mental health problems and hear about how they have utilised exercise. By doing this, we can understand things which we wouldn’t have otherwise. For example, are there elements of exercise that are made harder for those with mental health needs? How do they overcome those barriers? How can we design research which targets those barriers? As someone with social anxiety, I exercise in a way that best suits me (which is mostly away from people)! I’ve also discovered that whilst walking helps me with social-related anxieties, it often isn’t quite enough to extinguish my OCD-related anxiety. It simply doesn’t have the same impact as running. I think details like this are important because someone else’s preferences (depending on their mental health experiences) could look very different. And if we don’t know these things, then we can’t even begin to recommend exercise as a mental health intervention. It’s not only useful to learn this stuff from people that we can actually relate to, but it’s essential. If we want people to care about the research that we do, we need to make sure that we are producing meaningful findings- and then communicate them in a meaningful way. People need to be able to relate to what we are saying in order for them to truly think “this could work for me”. This applies to exercise because, while I don’t think it’s a miracle-maker, it can certainly brighten up a stormy day. And sometimes, when a ‘cure’ seems unlikely, that’s enough.